Aquascape AquaBasin Medium is designed to take the guesswork out of installing Aquascape Paver Fountains, WaterWall Spillways, and other various water feature designs. Handling flow-rates up to 2,000 gallons per hour, the AquaBasin is easy to install and ideal for use with a wide-variety of water features. 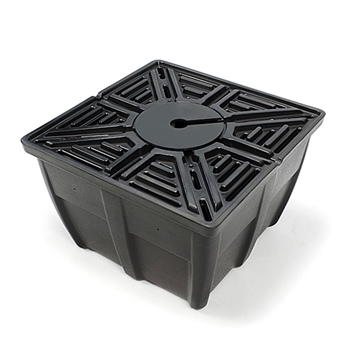 Professional-grade, high-density polyethylene gives the double-walled structure superior strength and weight distribution, supporting a weight capacity up to 1,200 pounds. The basin also has an extra-large 40-gallon water capacity; minimizing time spent filling the feature. A pre-drilled hole in the center of the basin makes it easy to hook up your plumbing and its 8.5-inch diameter pump access panels make maintenance simple and easy. The Aquascape AquaBasin Medium also carries a limited Lifetime Warranty.